Most single-vehicle crashes are the result of a too-fast corner entry speed. My friend and track day student, Joshua had a problem with numbers 3, 4 and especially 5. Josh had a great day at the awesome New York Safety Track until he didn’t. Check out his VIDEOS BELOW to see how his day ended. He walked away unscathed, thanks in no small part to his quality riding gear. ATGATT, baby. The same can’t be said for his beautiful GSXR1000. It slid off the track without much fanfare until it hit some protruding piece of Earth and flipped a few times. Oh well. It’s just a machine, remember. Below, you can read Josh’s account of the situation and what he learned. Riding a motorcycle is more of a mental exercise than physical. Yes, it takes physical coordination and a certain amount of strength to operate a motorcycle. But, riding a motorcycle well is much more than simply operating the machine. It also includes using excellent judgement and having deep knowledge about how to manage all sorts of situations. Mark Brown from MotoMark1 uses the term “driving” to emphasize that you must not passively “ride” a motorcycle, but rather “drive” it with purposefulness, authority and competence. Josh was doing great all day and, as was the case with another rider at the track that day, got over confident and pushed just a little bit harder than he should have. This mental lapse is essentially THE reason Josh crashed. 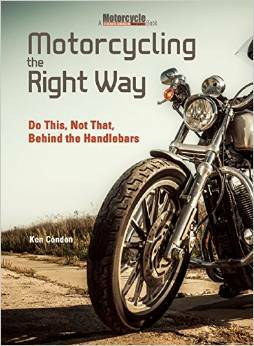 A too-fast corner entry is the #1 reason for single-vehicle motorcycle crashes. Josh and I had worked together during a Personal Instruction Day last week at the NH track on strengthening his “skill foundation” to allow him to safely “drive” his bike at the pace he is eager to achieve. We made good progress, but the eagerness and drive Josh has for rapid improvement seems to cause him to push harder than he should. This is common with highly motivated people. I can name two other very good riders who are motivated to ride at a top level, but have not yet learned and applied all the information necessary to be able to ride at that level…yet. All motorcyclists who are eagerly developing their physical skills must also develop their ability to monitor their attitude, self-evaluate their real progress, and use judgement that is in line with their true capabilities. Now that we understand that the crash could have been avoided with a bit of “judgment double-check”, let’s talk about what went wrong and the mechanics of how the crash could have been avoided. Remember: A too-fast corner entry is the #1 reason for single-vehicle motorcycle crashes. Either method will work to achieve the goal of slowing to a comfortable entry speed. Braking earlier is generally the best solution where you have more time and space to modulate your brake force to slow without anxiety. Josh did not alter his “begin braking” mark, so he found himself flying past his usual brake marker and therefore reached his turn-in point at a higher speed than he was familiar (or comfortable). You can clearly see in the forward-facing camera angle that he was missing the apex and then used greater handlebar pressure (countersteering) as he attempted to stay on the track, which overtaxed the front tire and it tucked. Could the crash have been avoided in the hands of a seasoned expert? With the bike at that speed and in that position in the corner, I would say maybe, but probably not. HOWEVER, the expert would have identified that he or she was traveling faster than before and because of this, would have adjusted the “begin braking” location to be earlier and increased the amount of brake force as needed to slow down sufficiently. Expert-level track day riders are comfortable braking very hard, because they have practiced this skill. He or she would have also used trailbraking to further scrub off speed if necessary as the bike was eased into the corner. However, I want to emphasize that trailbraking is not really “meant” to be a technique used to salvage a blown corner. Done correctly, trailbraking is a planned method for stabilizing the motorcycle when entering corners. That said, if you have trained yourself to trailbrake as it is meant to be used, then it is at your disposal when you need a longer duration of braking force if you inadvertently enter a turn too fast. Read all about trailbraking HERE. Remember that if you change one thing (faster straightaway speed), you must adjust other things (brake marker and/or brake pressure) to reach the entry speed you are able to handle. Please learn from Josh’s unfortunate mistake and keep your enthusiasm and eagerness in check and resist introducing significantly faster speeds until you understand the concept of cause and effect as it pertains to adjusting entry speed. Staying within limits is a lesson I strive to drive home to my students every weekend as an MSF RiderCoach. The motorcycle, the rider, and the time & space limits around them. My hope is that every rider I come in contact with has takeaway points and thinks about actions and decisions made while riding. My overall goal as a rider is to learn, fine-tune, and practice as many new and advanced skills as I can. I feel the biggest joy of riding is that there is always something new to work on or perfect. Each year I try and take on something new I can use as a rider and coach. A few years ago I had an opportunity to take a course on dirt bike techniques and later on I was able to become a certified MSF Dirt bike Coach. Last year my new goal was to learn to become proficient in riding on the racetrack at speed. I went out and bought every book and DVD I could find on the subject, and also a shiny GSXR 1000 that I thought at the time would be a perfect bike to go out and lay down some hot laps. Books and video’s are great tools, however to really be able to learn and apply the skills takes tons of coaching, practice and fine tuning. My biggest obstacle is always trying to rush and accelerate my learning. I want so bad to be the best and smoothest that I do not take the advice I give to my students. I try and go from step A all the way to step Z in one day. Learning should be in stages and is a building block process. Learn the gross skill 1st and stay within your limits. Ken gave me the best advice of all when he said “Slow down and get smooth 1st”. I was doing pretty good and learning the New Track. Taking my time and finding reference points and determining where I should look, brake, tip, and accelerate. It was near the end of the day with only 2 sessions left. I was a little tired and sore from working hard on my body position and riding. I started the 2nd to last session and started letting my mind drift away a little bit. I was thinking about the ride home and my fatigue level and on the video footage I had been recording all day; what I would be showing my friends and family and how cool I would look. I decided to try one more lap and call it a day. I said to myself. “You can push a little harder and get one awesome lap to end the day.” I got to the start of the straight. I did a head check to see if I was holding up any riders. The coast was clear and I gave it all I got. I pinned the gas and tucked my head. Glancing at the speedometer I saw the numbers climbing 130,140,150. I looked up and saw the end of the straight fast approaching. I got on the brakes with a force that seemed very heavy. I was squeezing in on the tank with all my might to hold myself from pushing forward. I saw the turning point approaching fast and thought “Oh No I just blew it” I had lots of speed and not much track left. I thought in the back of my head. You can do this, usually riders have less skills than the machine they are on. I tried as hard as I could to get into a hang off position and turn the bike. I gave it a flick into the corner and felt the front dropping out. I saw the ground rushing up to my shoulder and I lifted my head up and away from the turn. Boom, I was on the ground and tumbling, I could see the bike flipping as I was tumbling and sliding into the grass. Every second was in slow motion as I could hear the plastic cracking and breaking off the bike. It seemed like I was going to slide forever and I was saying to myself. OK, please stop now. Once stopped I stayed still, counted to 10 and started to assess if anything was hurt or broken. Not even a scratch. All the gear I had invested in paid off big-time! I looked at the bike and wanted to cry. I knew as I started to scream down the straight I was pushing too hard. I had not taken the advice I want to instill in every single student. I got up and started looking the bike over. Seeing everything all smashed is a feeling I could do without. The session still had 15 minuets to go and all I could do was stand there and wave as my friends and fellow riders went by making smooth turns and having a blast. Sometimes we do not take our own advice and need a hard lesson to set us straight. In that corner if he had hung off the bike much further body position, drag a knee ,helping the bike to be upright, conserve tire traction , he would have made it. Great words of wisdom, and thanks for having the courage to share. I have learned a lot from your experience. It was great to meet you – I wish your day had ended differently, but you have certainly made the best of it! I hope to see you soon at another track day event!! And Ken – thanks for having this great blog!! Josh, It was good to meet you Monday and I’m glad you are okay Your beautiful gixxer will be okay after a cash infusion. Rest up, hope to see you again soon.